Mangrove conservation is something that is unheard of to many and the benefits of it are understand by even less. This blog aims to give an insight into the role of mangrove conservation and to start to explore the benefits it has, particularly focusing on why the human population should show an interest. The Oxford Dictionary defines a Mangrove as: “a tree or shrub which grows in tidal, chiefly tropical, coastal swamps, having numerous tangled roots that grow above ground and form dense thickets”. They are not a species of plant but a collection of plants and shrubs that have adapted to the salinity of tropical tidal waters. Often the word conservation is associated with exotic and exhilarating animals such as: lions, tigers, rhinos, cheetahs, turtles, sharks, whales. So it comes as no surprise that often not a lot is heard of mangrove conservation. 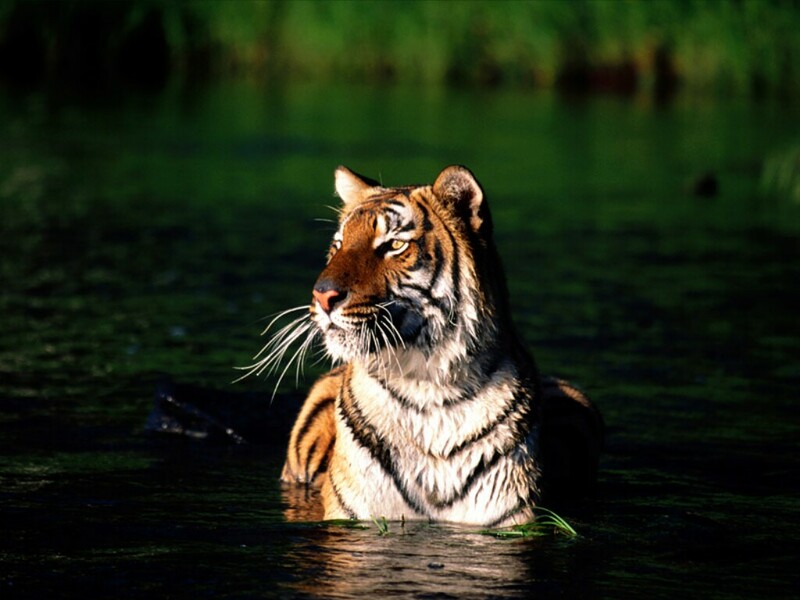 However, conserving the mangrove forests could help to protect animals such as crocodiles, numerous fish species, a variety of marine mammals, even tigers and most importantly it could be the difference between life or death for another human. Mangroves are halophytes, they are able to tolerate waters of a high salinity through various adaptations. Their leaves are able to excrete salt and they have the ability to control the opening of their stomata so that not too much water is lost through evaporation during hot conditions. Their roots have also been adapted to stop too much salt being absorbed. These adaptations allow them to live in coastal waters and their location is the reason why they are so useful to various species of flowers and fauna. Being so close to coastal waters it is not a surprise that the mangrove action project estimate that 75% of all tropical commercial fish spend a least part of their lives in the mangroves. The sheltered waters provide the perfect environment for nursery grounds and shelter for the fish and they also help to sustain a huge and complex food chain. Removing this would not only effect various species of fish, and other wildlife, but it would also have major repercussions on us economically, due to its effect on the fishing industry. However, the mangroves have been used since ancient times for their wood and sap for wood to burn and build with. It would seem easy to assume that their loss is of little importance but it does come with consequences that affect the human population both directly and indirectly. It is generally accepted now that it is becoming increasingly important to reduce our carbon footprint on the Earth. However, it has been estimated that the current levels of carbon dioxide are the highest they have been in the last twenty million years (Climate Change 2001: The Scientific Basis). It is well known that plants are able to remove carbon dioxide from the atmosphere through photosynthesis, Mangroves are certainly no exception to this. Most plants have the ability to store carbon in their leaves,trunks,roots and in the soil but mangroves are unique in that their soil has no maximum capacity for carbon. This means that they are continuously able to remove carbon dioxide from the atmosphere. Thus making them vitally important to us. This carbon can be stored for millions of years in the soil, and so cutting down mangroves not only stops them performing their role in removing carbon dioxide from the atmosphere, but it also releases masses of it back into the atmosphere. 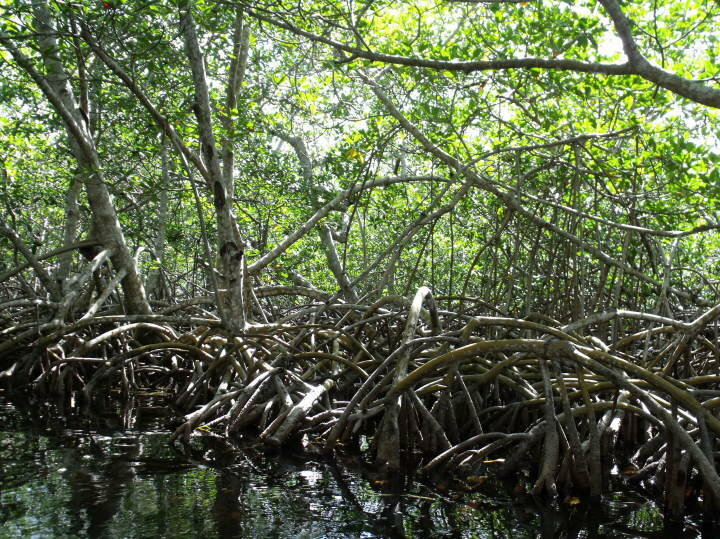 However, a new study from Cambridge University, headed up by Mark Spalding, has shown how not all mangroves are equal in terms of biomass. The map that was produced from this study can be seen above, knowing which areas of mangrove forests are most and least carbon rich could help us to use mangrove as a resource in a sustainable manner. With concerns of sea levels rising due to global warming, it is vital that we try to reduce the amount of carbon we are putting into the atmosphere and maximise the amount being taken out. With half of the world’s human population, according to AAAS, living within 200 kilometers of the coast (and this figure is expected to rise to three quarters by 2025) mangroves play a vitally important role in protecting masses of the human population from potential disasters such as floods, tsunamis and storm surges. The complex root system of the mangrove allows it to hold strong against rough waters and enables it to soak up water that could otherwise flood nearby villages and towns. Mangrove also act as a buffer between the land and sea, absorbing energy from waves and reducing the impact it will have further inland. During the 2004 tsunami in the Indian Ocean it is thought that, according to a report on science daily, the buffering effect of the mangroves could have reduced the energy of the tsunami by over 90% in some places. Where villages should have been left destroyed the mangroves left them almost unscathed. This is as good a reason as any to protect the mangroves. All in all it would seem that the mangroves play too vital a role to the Earth’s various communities, be that humans, mammals, fish, birds, plants etc., to just ignore the fact that we need to protect and preserve them. Whether it’s because they help to provide sustainable ecosystems or because they play a major role in reducing the amount of carbon in the atmosphere or that they have been shown to save lives in natural disasters such as tsunamis, it is evident that the mangroves are of a huge importance. Whilst we will almost definitely continue to use their resources, we need to be mindful to the impact it will have, we must use them in a sustainable manner. Mangrove Conservation is a must. IPCC (2003) Climate Change 2001: Working Group I: The Scientific Basis, : GRID-Arendal.